Anti-Static Orange Nylon clean room packaging film is an ideal answer for challenges involving toughness, cleanliness and maximum resistance to abrasion. Anti-Static Orange Nylon used for cleanroom packaging is an unplasticized orange-tinted film. Anti-Static Orange Nylon is a hydrophilic (water-sensitive) material; moisture acts as the plasticizer. The higher the moisture content of the film, the more flexible and rubbery it behaves. Standard items manufactured from Anti-Static Orange Nylon are clean to NASA PRF 5322.1 Level 50A. Of all the Anti-Static Nylon resins tested, this product has an extremely low non-volatile residue test results. Anti-Static Orange Nylon meets Material Spec MIL PRF 22191 Type III and is certified to the ESD Properties of MIL-PRF-81705E. Anti-Static Orange Nylon was originally chosen by the Aerospace community due to its Self-Extinguishing Feature. With the heightened concern for fire safety after the Apollo 1 fire and similar problems with Solid Fuel Systems, this material was written into a number of process specifications. 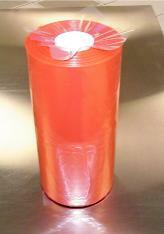 Anti-Static Orange Nylon Bags are available in flat sizes from 2” x 2” to 36” x 60”. Anti-Static OrangeNylon Tubing is available in widths from 2” to 36” with standard lengths of 500 and 1000 feet. Anti-Static Orange Nylon Sheets are available in sizes from 1″ x 1.5″ to 36″ x 60″. Anti-Static Orange Nylon Sheeting is available in sizes from 2″ to 60″ in standard 500′ and 1000′ lengths.